When developing a lubrication strategy for QDC, companies should never consider a component in isolation. Instead, shops should ensure that various elements--including lubricant dilution, nozzle placement, quick-change devices, and intelligent process control--work in concert to prevent errors and shorten press setups. To survive, a person’s body relies on getting fluids to the right places at the right time, and the same goes for the stamping process and die lubrication. When should the lube turn on, and for how long? 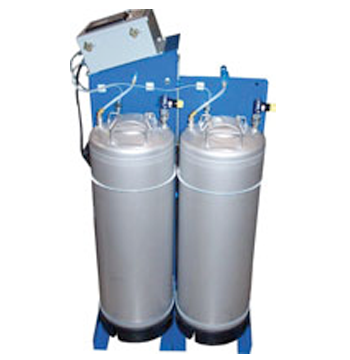 Does the process require flooding, split-second lubrication, or minimal lubrication? The list of variables goes on, and if a technician overlooks any one of them, he may produce rejected parts, damage tools, and cause lost production time. Stamping requires a system to distribute the die lubricant mixture accurately, thoroughly, and economically with the proper pressure and volume to supply fluid consistently to each spray nozzle. Stampers must ensure nozzles are positioned properly and the lubricant mixture mixed correctly, with proportions tailored for the application. Finally, stampers can find ways to optimize changeover to reduce setup time and, just as important, the possibility for press setup error. When running a takeover tool or a new product, shops should always discuss process requirements with their die lubricant supplier. In a job shop, every takeover tool might have specific customer requirements when it comes to lubricant application. Automotive companies, for instance, have specific, approved fluids for their tools, and those are the only fluids operators can run for those jobs. This becomes especially critical when stamping parts that will be painted or plated. Certain lubricants cause extreme problems during plating or painting, so in these cases parts washing needs to be considered in the per-piece price. Certain equipment may not be able to spray or roll-coat in an area needed for the application, or mix the lubricant to the proper dilution ratio. A die lubricant supplier should be well-versed on the metallurgical forming characteristics as well as the painting and plating of the required metal. Multiple-metal lubricants can be a worthy investment for operations with frequent changeovers. In some cases, the same lubricant can be applied to hot-roll, cold-roll, and even high-strength steels, just at different dilution ratios. Of course, other job-specific lubricant variables—like fluid pressure, application method, and lubricating locations—still apply. All lubricants are not created equal, which is why stampers should never use generic or homegrown lubrication concentration charts. Each lubricant has a specific viscosity and level of solids. Even at identical concentrations, two different lubrication grades will produce different results on a refractometer. That’s why, to establish proper concentration levels, setup personnel must use the concentration chart supplied by the die lubricant supplier. Some steels may run better than others with a certain lubrication product, which is why establishing the proper dilution ratio is so important. The supplier’s concentration chart is the right starting point, but some design of experiments (DOE) may be required, depending on the application. Some lubricants may cause staining or a white chalk film, which might not be acceptable. Different material stock of the same thickness may have different forming, blanking, or fineblanking characteristics. Die age and wear can play a role here too. In many cases, determining the precise dilution ratio becomes more of an art than a science. Lean manufacturing has become a major focus of so many modern stamping businesses. Many companies must maintain process controls for short- to medium-volume production jobs. And even with fully documented process datasheets completed and available, stampers can overlook certain process variables. These can include many variables in quick die changeover (QDC), such as lubrication. If the next job on a press requires a different die lubricant, a stamper should purge the nozzles’ spray lines with air, water, or a cleaner. This becomes especially critical when an operation has in-die lubrication points buried in the die steel. If technicians don’t purge spray lines adequately, this may cause clogs and, ultimately, several hours of downtime. A shop can install simple equipment that will purge the lubrication system automatically before the die changeover. Installers can wire such equipment directly to the press controls, and time it so that it purges when the press is down for a certain period. Or, personnel can activate the system with a selector switch to clean the spray lines before they remove the die from the press. Figure 1: This dual-tank setup allows personnel to change over between different lubricants quickly. Straight oil and water don’t mix. So what if an operation requires a change between a water-based and straight-oil lubricant? The oil will float to the top, and the leftover water-base lubricant remains at the bottom of the tank. As the stamping operation starts, the system draws the water-based lubricant from the bottom of the tank, and not the straight oil the application requires. This is why it’s ideal to have separate holding reservoirs for different die lubricants and mixture ratios (see Figure 1). This helps eliminate the possibility of incompatible die lubricants contaminating each other and plugging the spray system. Once the die lubricant is changed over, technicians should check the lubricant concentration before each production run to make sure they have the proper dilution. They can use a refractometer or a moisture analyzer machine that determines the percentage of solids in a lubricant. And again, they must compare the reading with the chart supplied by their lubricant supplier. Controller technology has helped shorten die changeover time greatly, particularly when it comes to lubricants. A shop may have an in-die lubrication setup in a progressive die with multiple tubes leading to spray nozzles in the tool. In some stations the nozzles spray every stroke, while at other stations they may spray every 10th stroke. Each nozzle also may spray at different times during the stroke cycle: some near top dead center, if lubrication needs to cover more area; others just after the press starts rising from bottom dead center, to apply lubrication in a localized area. Each nozzle may spray certain amounts for a certain period of time—be it 2, 20, 100 milliseconds, or any other duration. Nozzles may atomize the lubricant through “airless” technology that minimizes heavy mist of the fluid, or by introducing a small amount of air pressure to break down the lubricant droplets smaller. All this makes up a precise lubrication recipe, or spray profile, that describes where lubricant flows, how much, and when. Ultimately, the spray profile ensures that the system applies the right amount of lubricant only where needed. Executing these recipes, a spray application control system communicates (via BCD, or binary capable device) values between two like or unlike brands of PLCs. In essence, the electronic communication ensures controllers are on the same page. When an operator loads a new part program, the system updates the spray profile automatically, eliminating the guesswork. Using such a spray application control helps optimize the process and reduce waste. Figure 2: Die-mounted, quick-connect systems help simplify changeover. In a traditional die change, setup personnel connect and disconnect all hoses individually. This can hinder efforts toward single-minute exchange of dies, and it also opens the door for error. In a hurry, a technician may well hook the wrong hose to the wrong nozzle. That in turn mixes up the lubrication recipe, with the wrong amount of fluid flowing to the wrong nozzles at the wrong times. To prevent this, some companies have installed quick-disconnect devices that help them achieve QDC and prevent errors. 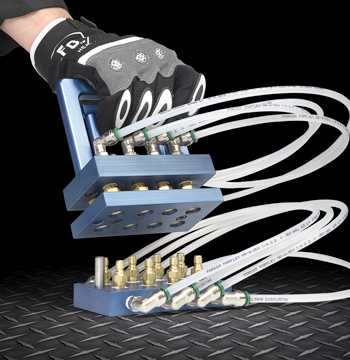 Each die has hoses connected to a standard manifold. During die changeover, the technician unclicks the quick-disconnect manifold, then removes the die. With a new die in place, he plugs in the new manifold, and then loads the part program and spray profile (see Figure 2). That proven spray profile ensures the correct amount of fluid flows to each nozzle at the right time. Lightning-fast die changeover doesn’t count for much if lubrication lines aren’t purged properly; or if fluid concentrations aren’t what they should be; or if nozzles aren’t placed properly for the application; or if the tooling, press, or even plant layout makes lubricant delivery difficult. Die lubrication, a critical process, often receives minimal attention. How will a stamper supply die lubricant to each press? How exactly will setup people apply lubricant to the die? What guarding or other equipment will catch overflow from flood coolant? Does the press have physical barriers to block atomized lubricant from floating into the shop air? Last but not least, do shop personnel know exactly how much die lubricant is used and how much is wasted? Ideally, stampers should ask these questions before developing a new tool, accepting takeover work, and before building or moving into a new plant. When developing a lubrication strategy for QDC, companies should never consider a component in isolation. Instead, shops should ensure that various elements—including lubricant dilution, nozzle placement, quick-change devices, and intelligent process control—work in concert to prevent errors and shorten press setups. In these days of high-mix, rapid-response manufacturing, speedy changeover has never been more important.